Walking with music can improve an essential skill. The gym is just a mile from my front door, so it makes sense to warm up by walking there, instead of driving a car and then getting on a treadmill. Striding along to my favorite playlist, I started doing what millions of others have done before me: walking to the beat of the song, which in this case was “The Resistance” by Muse. Once it finally gets going, that song requires some pretty brisk stepping to keep up with the beat. I almost skipped the next song because the beat was too slow—the lilting, languid “Waterfall,” by Jimi Hendrix. But despite the challenge of the rhythm, I walked to it, ignoring the certainty that my slow-motion steps made me look like an idiot to drivers speeding by. And so the Big Balance Workout was born. First, a little about balance: It’s an essential quality for being active, yet balance is not as simple as it may seem. One of its major requirements is strength, which is why someone who has been weakened by illness—even from something as relatively brief as the flu—will be shaky when they get out of bed and stand again. Balance is also a product of experience. As you become more experienced in activities like biking or skating or playing a sport, your balance improves. Your body “learns” which muscles to use to keep you upright in each activity you do. For example, riders in the Tour de France learn bike balance so thoroughly that they can ride down a winding mountain road going faster than 60 mph—with other riders in the peloton just inches away—and stay upright (though this year, not so much). Most balance workouts don’t use a big range of motion. You can practice standing on one foot and trying to relax so that you don’t wobble, but you’re only learning to stay upright in one position. Learning to handle the weight of your body in a range of different positions is the key to athletic balance. Athletic balance is why athletes like elite park skateboarders, freestyle BMX riders or climbers can get into off-center positions without falling. But even for those athletes, getting good at extreme balance began with baby steps—like walking to a variety of music beats. Walking may require only basic balance, but it’s still a complicated sequence of movements. The upper body is propelled along at a smooth and steady pace, while the legs move independently, lifting and absorbing any terrain irregularities. Muscles react quickly to make corrections if the body weight is suddenly shifted. But the biggest aid to walking balance is momentum. Your foot may not step accurately, but the momentum of your upper body carries you past that step while your other foot adjusts, and so you don’t fall. The problems come when you hit something unexpected, like a slippery surface, or one that shifts under your feet because it’s made of sand or small pebbles. If you’ve been depending on momentum for balance, you’ll go down. 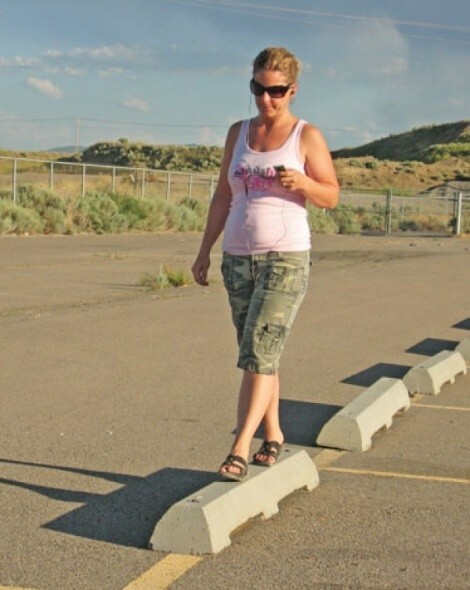 But, you won’t fall if you’ve learned to stabilize your weight as it moves in every range of motion while walking. Taking a long, slow step to a slow-ish beat like “Hey, Soul Sister” by Train or an erratic beat like Lady Gaga’s “Bad Romance” forces you to learn to balance your upper body over your legs as each foot is lifted and moved forward. This is not dancing. You don’t double-step, bounce or move your hips. You stride forward, disciplined by the beat of whatever song comes up. Make up your playlist accordingly. Combine fast and slow songs—tunes that require you to stand on one foot while the other foot is up in the air slowly moving forward. Include rhythms that demand balance at a pace where momentum can’t be a factor because the beat is too furious. At first, you may be sketchy, especially with such a varied mix. But as you condition your sense of balance during these walks, you’ll become more sure-footed, more stable and much more athletic.